5 Must-See Corporate Gifts | Norscot Group, Inc. The Holidays are launching early this year. I’m sure you have seen it at basically any major retailer around, trying to get the holiday spirit of gift giving in the back of your mind. If sets of Jellies and meat and sausage platters are your go to for the staff or client gift you may want to consider some other options this year. 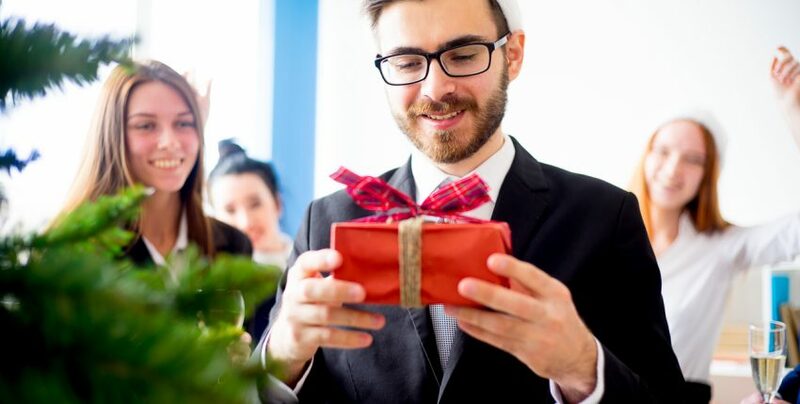 So, if you are in the market to share some Holiday joy with your staff here are the 5 hot items you need to get. 1) S’well bottles: They come in all colors, prints and textures. These bottles range in size from 9oz to 25oz. They are trendy, easy to hold and they actually work. Fun seasonal prints like woodgrain and metallics are a great way to make this gift feel custom without the hassle of personalization. If you are thinking that this is a perfect gift for your staff keep in mind they can range in price from around $25 for the basics to $1500 for Swarovski crystal embellished bottles. There are also other companies that can create your own special décor on the very trendy tapered vacuum bottle. 2) Customized libations bottles: Spreading a cup of cheer has also taken on a new meaning this holiday season as the trend of completely customizable wine and liquor bottles is taking off. Some companies are offering items like custom liquor bottles in a custom wooden box labeled with a vintage inspired printing of an individual’s name. It’s a very classic yet contemporary gift with a high level of elegance. If whiskey and bourbon are not to the liking of your gift recipients, there are also fun and enjoyable custom wine labels with a bit of holiday spirit. These are able to ordered in a much greater quantity with simple sayings such as “Happy Holidays” or “Eat, Drink and be Merry”. 3) Power banks: Since most of us value our phone more than our lives power banks are an ideal gift for a staff to help them stay connected. Multiple pattern and design options make them have a custom feel but they can be ordered in bulk. They can be found in multiple different styles, however, the circular Qi charging stations and the sleek pocket friendly size are by far the most popular with the on-the-go crowd. 4) Gifts that donate: Many companies throughout the holiday season run promotions to encourage sales and some of these are a donation for a foundation or group in need. Some of the companies like Grounds and Hounds give back 20% of their proceeds to animal rescues around the company. If giving a gift that gives back appeals to you there is so much more than just coffee. Depending on your crowd try hand embroidered ornaments from Heifer International who help small businesses and empower women all over the world. Other places to look into: Love is Love Dishware, Fire Dept. Coffee, Love your Melon, The Home T and One Hope Wines. Depending on your business, you may also want to encourage gifts for entrepreneurs around the world by checking out kiva.org. 5) Food! : You can never go wrong with a unique twist of a food gift box. Have a fitness junkie? Great! You can get custom protein bars from elementbar.com or youbars.com and have them labeled to give your staff energy and a tasty treat. There are also healthy options from Urthbox and Nature Box that can be sent right to their door step or the office. With these types of gifts you can truly give a customized experience based off of multiple dietary and taste preference factors. There are so many more items that could be on this list but these items are a good start to get the creative gift giving juices flowing and inspire some custom holiday cheer. Happy Holidays!